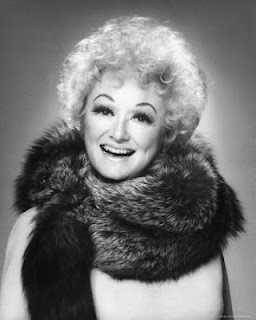 Phyllis Diller: she loves a stiff wick. Some of you haute candle lovers may ooh-la-la over Cire Trudons, Frédéric Malles and Diptyques, but I'll bet you their start-up stories can't hold a (ahem) candle to that of good old Yankee Candle. It seems Yankee Candle founder Mike Kittredge was only 16 when he stumbled on the idea for the company after throwing together a last-minute Christmas present for his mother. The idea? Melt down a bunch of old crayons into a candle. Mmmm...crayon-y! Even though Yankee Candle have become the Little Trees of wax-based olfactory assault, they're not resting on their wicks. Their latest innovation is “Man Candles”: guy-oriented candles redolent of blokey activities. How about the 'Man Who Can't Be Bothered To Cook' candle sub-series: 'Cold Pizza'; 'Poorly Dissolved Pot Noodle'; 'Microwaved Korma'...? "Poorly-Dissolved Pot Noodle" gets my vote! Poorly-Dissolved Pot Noodle is what my name means in Japanese. Eww, "moist" anything I can smell from here. I only have simplistic ideas. Beer. Bacon. I did have the chance to sniff these. Man Cave and Riding Mower were nothing special. First Down was an OK leather. 2x4 for me was a real winner - wood and sawdust, a refreshing change from Yankee's normal floral fruit lineup. When it comes to Man Candles, the simpler the better, Jeff. And I can't believe you were lucky (!) enough to actually smell the MCs! 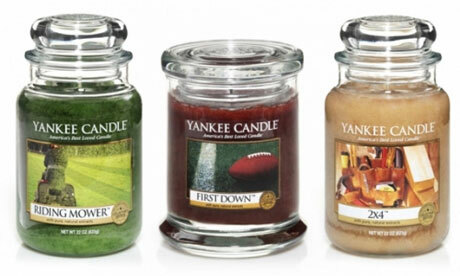 Maybe the success of 2x4 will signal further conceptual smells from Yankee Candle. I am not a man, but I'd be very happy to smell and buy 2x4. I love wood! Smelling a beer candle is not really on my list. I'd expect a german pub smell and I surely do not want that in my room. Speaking about german beer - the beer candle could be called "Oktoberfest". Great name for this candle! I'm not sure what else can be said after that! It should be called "Rode Hard and Put Away Wet." I need to be in Marketing. Oh, my, I didn't know that was a for-real perfume, I thought it was perfumistas having a bit of blogging fun! I wonder how well it did?? Well, it sold out instantly and then was available for a bit online for silly money, so I'd say it was a hit! I'm holding out for "WD-40" and "Duct Tape" scented votives. 2x4 - Best of the bunch. Dry, plain wood with perchance a small hit of something vanillic. My favorite. Riding Mower - pure, cut grass, although slightly pale. Decent and verisimilitudinous to the original. First Down - artificial turf plastic and nothing more. Barely a scent to be discerned. Man Cave - described by my friend as "Axe Spray Gone Clubbing." Thanks for contributing actual information on the scents in the middle of this ha-ha scoff-fest. YC may be onto a winner with 2x4. I think that branching into the 'male' candles is a great idea - my husband although he would really admit it loves scented candles and i know he would buy them! Probably not in a shop but from the safety of the internet!!! Looking forward to Man-kee Candles!! Father's Day, HERE I COME!!! "Resting on their wicks" - priceless! I would like to add a duo of scents entitled "persistently fails to mow lawn" and "persistently fails to put bin out". One could smell tantalisingly of grass clippings, the other not so tantalising generally. And I think many men could relate to the scent of "oh no, not another blasted screwdriver set for Xmas!". On balance, both Riding Mower and my negative counterpart to the current scent would just be too upsetting. How about "man unexpectedly knocks up a casserole" instead? There's an aroma that would reel me in! How do you knock-up a casserole? Ha. "Knocks up" is the Brit vernacular for "throws together." How about a candle called "Ignoring misandry"? Is there an Old Spice candle? By the way, would like to make this a misandry-free zone. My hubs is the greatest dad ever, much like my own Pops--fun, silly and patient with the babies. When I was preggers the first time, it was kind of like he was, too. He kept stress-eating and then he'd look in the mirror and ask if he looked fat. There's no man-hatred afoot here - just a playing along with Yankee Candle's goofy stereotyping. Oh how about.... "It's not you, it's me" Candle....? Then the ever popular "I'm Sorry, I'm Gay" candle. Now we're getting into the brutalities of real life.